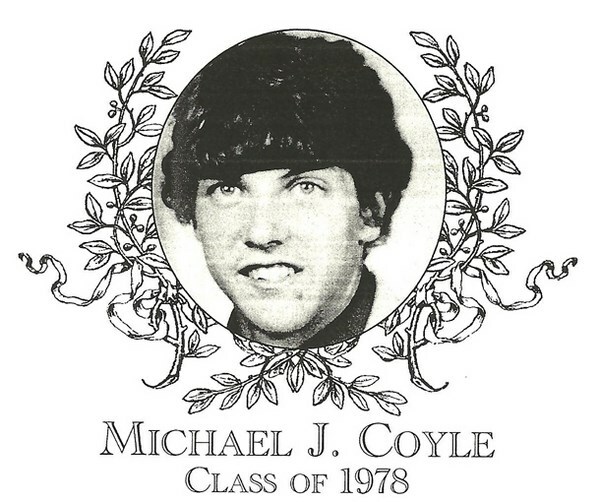 Mike Coyle was one of Bartlett High School�s most versatile and well-rounded three-sport athletes and earned ten varsity letters during his stay with the Green and White. In the sport of football, Mike took over the quarterback chores as a sophomore and was an immediate impact with his strong arm and leadership skills. It was during his junior and senior years that Mike Coyle truly spearheaded the Jim Healy coached Indians. Mike led the Green and White to an 8-2 record as a junior filling the airways with footballs on his way to a 1,000-yard season. In his senior year, again he threw for over 1,000 yards including 195 yards in his last Turkey Day game versus Southbridge. Over the span of three seasons and 30 starts, Mike threw the pigskin for three 1,000-yard seasons. Basketball season found the crafty Coyle racing up and down the hardwood for both Don Cushing and Bob Paranto. Mike was a three year starter at point guard on highly successful teams, which recorded a cumulative record of 50-16; three Clark Tourney appearances; three District Tourney appearances; and two Border Conference Championships. Mike would end up as one of the top playmakers and assist-men to ever play basketball for Bartlett High as he recorded over 850 career assists including a single game record of 21 assists. He was chose to three league All-Star teams and two Telegram and Gazette All-Star teams, including being selected to the prestigious T&G Super Team, and was nominated to the McDonald�s All-American High School Basketball Team as a senior. In the springtime, Mike staked his defensive skills to shortstop on the Green and White baseball diamond where he was a three-year starter. His defense had great range and he put the football quarterback arm to good use on the diamond as well. Michael was a three-sport captain in his senior year. At graduation from Bartlett, he was presented with the George Finnegan Award as the top senior male athlete. Michael attended Slipper Rocky College in Pennsylvania where he started at quarterback as a freshman. From 1981-86, he proudly served the Marine Corps and graduated from Emerson College in 1990. Michael Is employed as a Sales Manager for a medical company and is married and lives on Long Island with his wife Tammy and two daughters, Emily and Abigail.